A woman with a rare disease has been spontaneously cured in an event so improbable doctors say it is the medical equivalent of a lottery win. The woman in her 50s, who is not being named, was plagued by warts and infections as part of "WHIM syndrome" - caused by a defective immune system. But US doctors say a fluke DNA mutation, reported in the journal Cell, effectively cured her in her 30s. One doctor said the odds of it happening were "astronomically low". Patients with WHIM syndrome have a defect in a single section of their DNA. They are still able to make the cells that form the immune system, but these get stuck in the bone marrow where they are produced. 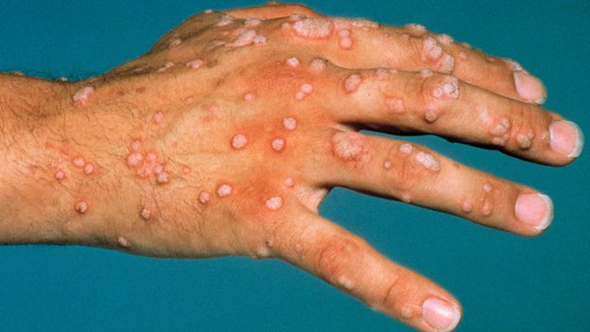 The patients are left incredibly vulnerable to infection, particularly the human papillomavirus that leads to warts and an increased risk of cancer. The woman, who has asked doctors not to reveal her name, was the first identified case of WHIM syndrome more than 50 years ago. But at the age of 58, she sought out a team of researchers at the US National Institute of Allergy and Infectious Diseases to get her daughters tested. She had passed the condition down to two of her daughters, but Dr Philip Murphy who was doing the testing was in for a shock. "My pupils dilated when she said her warts had disappeared 20 years ago," he told the BBC News website. The team then tried to figure out how this "miracle case" occurred. The cure was traced back to a mutation in a single cell in her bone marrow. An event called "chromosomal shattering" in which a part of the DNA is rearranged led to 164 genes being lopped out of her DNA. Crucially this included the mutated one that was causing the problem. If this had happened in a muscle cell it would have made no difference to her. But it took place in a stem cell that manufactures immune cells. That cell was able to gradually take over the bone marrow and was the starting point for a new immune system that could get into the bloodstream. Dr Murphy told the BBC News website: "It is really kind of remarkable, she started out as this very unlucky girl and ended up winning the lottery by having this incredibly rare event, the only one reported in the world to date that basically. "She no longer has warts, is no longer [more] susceptible to infections and no longer has blood abnormalities. "The odds are astronomically low." He hopes a deeper understanding of the disease could lead to a treatment or even better ways of carrying out bone marrow transplants. Prof Andrew Jackson, from the MRC Human Genetics Unit in Edinburgh, told the BBC: "This is an interesting tale. "I see patients with genetic disorders all the time and it's often 'what you're born with is what you're left with' so spontaneous resolution is something we wouldn't expect or hope for." He said there had been "similar tales" in other conditions but this was coupled with excellent science "giving biological insight" into the syndrome. He also said it was important to find out what role the other 163 genes that were affected by the mutation had.